Fig Tree Books LLC, 9781941493144, 279pp. For most of us, remembering the Holocaust requires effort; we listen to stories, watch films, read histories. But the people who came to be called "survivors" could not avoid their memories. 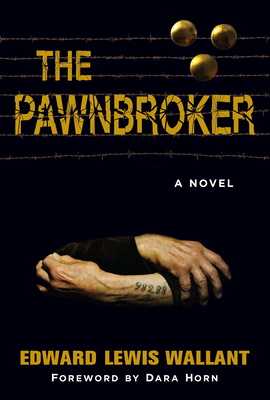 Sol Nazerman, protagonist of Edward Lewis Wallant's The Pawnbroker, is one such sufferer. Remarkable for its attempts to dramatize the aftereffects of the Holocaust, The Pawnbroker is likewise valuable as an exploration of the fraught relationships between Jews and other American minority groups. That this novel, a National Book Award finalist, remains so powerful today makes it all the more tragic that its talented author died, at age 36, the year after its publication. The book sold more than 500,000 copies soon after it was published. When he died at 36 in December 1962, Edward Lewis Wallant had published two novels: The Human Season (1960), which received the Harry and Ethel Daroff Memorial Fiction Award for the year's best novel on a Jewish theme, and The Pawnbroker (1961), which was nominated for the National Book Award and secured Wallant a Guggenheim Fellowship. Two additional novels--The Children at the Gate and Moonbloom--were published posthumously. The Daroff Award was subsequently re-named in Wallant's honor. The Edward Lewis Wallant Award is now presented annually at the University of Hartford in the late author's native Connecticut; recipients have included Chaim Potok, Cynthia Ozick, Francine Prose, and Dara Horn. Dara Horn is the author of four widely acclaimed novels and the recipient of honors including the National Jewish Book Award, the Reform Judaism Fiction Prize, the Harold U. Ribalow Prize, and the Edward Lewis Wallant Award. She earned a PhD in comparative literature from Harvard University and has taught courses in Jewish literature and Israeli history at Sarah Lawrence College and The City University of New York; in 2014, she held the Gerald Weinstock Visiting Professorship in Jewish Studies at Harvard, where she taught Yiddish and Hebrew literature. She lives in New Jersey with her husband and four children.